In United States v. DE L’Isle, No. 15-1316 (8th Cir., June 8, 2016), the federal appeals court for a large portion of the mid-west ruled that an individual has no right to privacy in the information contained on the credit card strip or on the face of the card. Eric-Arnaud DE L’Isle was pulled over by a Nebraska police officer in 2014 for following too closely to a semi. The officer stated he smelled marijuana in the car and conducted a canine search, which indicated the presence of controlled substances. The subsequent search produced no drugs, but the officers did find a duffel bag containing “a large stack of credit, debit, and gift cards” in the trunk. Only about 1/5 of the cards had DE L’Isle’s name on the front. The cards were seized at the stop and then scanned by the U.S. Secret Service, which discovered that the magnetic strips on the cards were either blank or contained American Express account information. Needless to say, none of the information on the magnetic strips was associated with any legitimate account of Eric DE L’Isle. According to testimony from fraud investigators and U.S. Secret Service agents, the magnetic strip on the back of a credit, debit, or gift card contains up to three lines of information. The first two are omnipresent and consist of the account number, expiration date, and cardholder’s name. The third line is discretionary based on the issuing entity, but can contain a particular identifier. DE L’Isle argued that the search of the strip constituted an invasion of his 4th Amendment right against the unreasonable search or search of his personal papers and effects. Under existing federal and Supreme Court precedent, this type of claim (contesting whether the search was reasonable) rests on a person’s actual expectation of privacy and on society’s expectation of privacy in the particular situation. In this case, DE L’Isle would need to show that he actually expected his credit card strip information to be private and that society had the same expectation. The Court expressly rejected his claim that he had an actual expectation of privacy. Mr. DE L’Isle’s subjective expectation was irrelevant, however, as the 8th Circuit panel found that “this alleged privacy interest is not one society is prepared to endorse.” In a rather broad definition of what is considered to be public, the court found that “any member of the public may see” the information on an individual’s credit card, so the information was therefore considered to be public. (The dissent in the case focused on factual issues, rather than the general privacy issues). While no one should have any particular sympathy for an individual who was, according to the evidence, clearly intending to engage in a substantial amount of identity theft and credit card fraud. Simply stated, Mr. DE L’Isle belongs in jail. The problem arises in how he ended up there and the implications for individual rights that the court’s needlessly broad analysis casts. The courts (the 8th Circuit here is only the latest example) have fundamentally misunderstood the 4th Amendment. The protections of the 4th Amendment apply solely to the government (we have criminal statutes to prosecute violations of privacy from individuals against other individuals). Thus, it is entirely irrelevant to a proper 4th Amendment analysis that DE L’Isle offered the information on the card to a merchant. The information on a credit card is inherently private and, generally speaking, individuals only offer that information to a select group of other private entities: merchants and financial institutions who are prohibited from releasing the information to the general public. Indeed, the crime DE L’Isle is accused of is stealing other individuals’ information. If there is no privacy interest in this “public” information, then what, precisely, is the criminal behavior DE L’Isle was prosecuted for and convicted of? At the time of the search, there was no indication that DE L’Isle actually used the cards or stole any money – he was merely in possession of what the courts apparently view as public information. The government’s criminal charges belie its arguments before the 8th Circuit. Despite the 8th Circuit’s ruling, credit card information is private information. Entire industries exist to protect that information from other individuals, much less the forcible seizure of that information by the government. Class action lawsuits have been initiated against major companies for negligent handling of information that resulted in hacking. To say that credit card information – even “just” the account numbers – is flawed, to say the least. Thus, not only did DE L’Isle demonstrate an intent to keep the information private (he kept the cards in a duffel bag and/or wallet to keep them from the view of the general public – and police), but society does, quite obviously, expect credit card accounts, expiration dates, the connected names, and particular identifiers to be kept private. Simply stated, the courts have been on a dangerous trend that dismissed the need for a warrant where it is evident that a warrant would likely have been issued. This case is a prime example: large numbers of credit cards without the individual’s name on them stored in a duffel bag in the truck almost guarantee the probable cause needed to obtain a warrant to both seize and search everything in that car, much less the particular cards and their information. Law enforcement only needed to apply for the warrant and there was no exigency demanding immediate action: DE L’Isle was in custody and therefore not putting any more charges on the cards. Knowing the information on the card several hours sooner would not particularly help the victims, either. The purpose of the exclusionary rule (suppressing illegally obtained evidence) is to discourage law enforcement from obtaining evidence improperly. If the police and prosecutors are confident that their convictions will be overturned when the evidence is improperly gathered, the theory is that they will be more constitutionally careful. Conversely, when law enforcement is comfortable that the court is more interested in upholding convictions it believes are worthy than upholding the Constitution, then they will be less inclined to be concerned about the procedural safeguards offered by the Constitution. This case is a perfect example of the latter: DE L’Isle was probably engaging in counterfeit. However, the evidence used to convict – the information gathered on the magnetic strips was not DE L’Isle’s – was not properly obtained, even though law enforcement easily could have obtained a warrant once they had possession of the cards (which was almost certainly obtained lawfully, at least according to the facts as outlined here). At the end of the day, the courts here chose to uphold a particular conviction, rather than the Constitution. 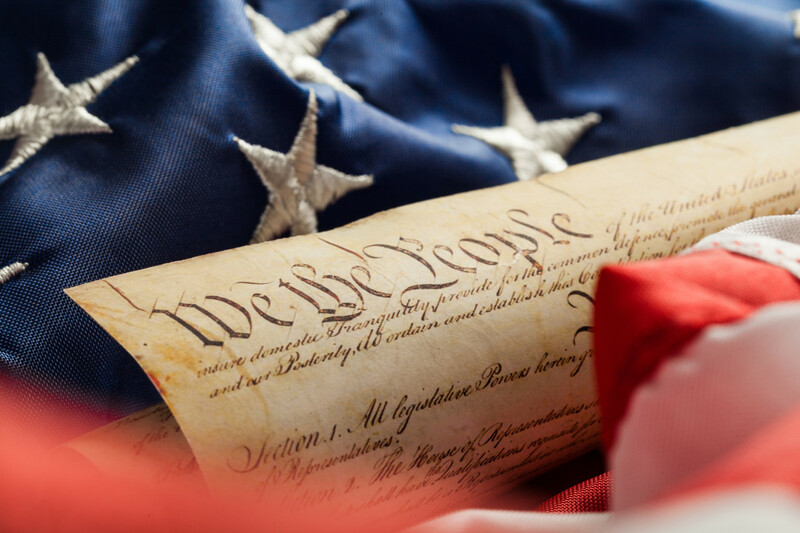 Thompson Law Offices is dedicated to the protection of civil rights, the natural rights and liberties of the individual, and the Constitution. If you believe your rights have been violated, call (888) 866-6947 for a FREE consultation. On February 16, Assemblymen R. Bruce Land and Bob Andrzejczak (both of District 1 in Atlantic, Cape May, and Cumberland Counties) introduced a bill into the Assembly, No. 2955, which they’ve entitled the “Citizens’ Protection Act.” The bill provides amendments that would make it realistic for a law-abiding individual to obtain a carry permit in New Jersey. Because the legislation is new and the issues important, at the end of the post, you’ll find links to a map of New Jersey’s Assembly districts and a list of members of the Assembly and their contact information. New Jersey is notorious for having some of the strictest firearms laws in the country. Perhaps the most public aspect of this has been the “justifiable need” provision in the application process to obtain a permit to carry a handgun. As the law currently stands, the individual seeking to obtain a permit must demonstrate justifiable need, which has been defined by the state courts to mean 1) “specific threats or previous attacks” that 2) “demonstrat[e] a special danger to the applicant’s life that cannot be avoided by other means.” In re Pantano, 60 A.3d 507, 510 (NJ Super. 2013) (Emphasis added). Thus, to get a carry permit in New Jersey today, you must have already been threatened or attacked and a carry permit must be the only way you can protect yourself. While the law holds no liability against municipalities for failure to protect an individual, most police officers will tell you that they view it as their duty to protect individuals against crime; while there are some notable examples to the contrary, this is true in most cases. However, as rightly noted by many firearms experts, life-threatening situations such as muggings occur very quickly and often there is no chance to even call police, much less time to wait for their arrival, no matter how quick it may be. Likewise, mass shootings often occur quickly and, by design, as a surprise to the victims. Thus, the bulk of the damage is done before police have an ability to arrive and assess and control the situation. Despite the serious constitutional questions as to New Jersey’s firearms permitting statutes, the federal courts have been content to let them stand. In a very recent case, the Third Circuit Court of Appeals held that it could not say with certainty that there was any right to carry a firearm outside the home inherent in the Second Amendment. See Drake v. Filko, 724 F.3d 426 (3d Cir. 2013). In Drake, the plaintiff had been approved for a carry permit by the local police chief, but when he applied to the Superior Court, the State Police objected to the permit. The Superior Court agreed with the State Police and denied the permit. That decision was appealed to the Third Circuit, which then held that the U.S. Supreme Court precedents – D.C. v. Heller, 554 U.S. 570 (2008) and McDonald v. City of Chicago, 561 U.S. 742 (2010) – applied strictly to the home (which is a very, very strict and selective reading of those cases). The plaintiffs then appealed the Third Circuit’s decision to the U.S. Supreme Court, which ultimately declined the hear it. With the death of Justice Antonin Scalia, is remains unlikely that any substantial changes to firearms laws will occur in the near future. All of which makes this bill so important for individuals who desire to carry firearms. Assemblymen Land and Andrzejczak begin the bill with a series of whereas clauses, in which they accurately state that the courts have found that the police have no affirmative duty (either federally or under state law) to protect an individual citizen. See Wuethrich v. Delia, 382 A.2d 929 (N.J. Super. 1978) (“Municipalities are expressly immunized from tort liability for the failure to provide police protection or the failure to provide sufficient police protection”). (It should be noted that under Federal procedure, a plaintiff sues the municipality in police force liability cases, rather than the police force, itself.) In addition, the Assemblymen spell out the New Jersey constitutional provisions under which citizens have a liberty interest in self-defense. This bill removes “justifiable need” from the statutory language by deleting the provision from N.J.S.A. 2C:58-4(c) entirely. By removing the justifiable need requirement, the burden would no longer be on the individual seeking the permit, but on the State if it intended to deny the application. Because Pantano interpreted the justifiable need statutory language, that holding would, in essence, be statutorily overruled. In tandem with justifiable need, the proposed legislation removes the requirement that an applicant take an approved application before the Superior Court. Currently, under N.J.S.A. 2C:58-4(d), the Superior Court may then reject the application (even though it has been approved by the local police chief) if the applicant’s character is found to be in question. Indeed, many of the precedential cases on New Jersey’s firearms permitting scheme involve denials by the Superior Court after initial approvals at the local level. The Citizens’ Protection Act would completely remove this step in the application process. Firearms owners will also be excited to learn that the bill would explicitly prohibit the State from recording handgun serial numbers and descriptions when granting the permit, nor would it allow the Superintendent of the New Jersey State Police to include additional provisions as part of the application process. Verification by the applicant that the information provided is accurate (which replaces the requirement of witnesses to the signature). The permit would also be valid for 5 years, rather than 2, and place the burden on the State to demonstrate that the individual is not eligible, rather than requiring the individual to prove to the State that he or she does not run afoul of any of the eligibility requirements. Anyone who is a U.S. citizen 21 years or older, has not been convicted of a felony (including certain juvenile delinquencies); has not been convicted of a domestic violence misdemeanor; has not been convicted of a drug crime in the 5 years prior to applying; does not have a physical or mental health defect that prevents them from safely possessing the firearm*; is not subject to a restraining order for domestic abuse; is not on the Terror Watchlist; and has not been an alcoholic or addict within the same time period, would be eligible, assuming they pass an 8 hour training course. Other provisions of note include the amendment of N.J.S.A. 2C:39-2(b), which provides that an individual found to be in possession of a firearm in a vehicle in New Jersey “shall be presumed that he does not possess such a license . . . until he establishes the contrary.” This means that the law currently grants a legal presumption of the presence of an element of guilt to the State of New Jersey in certain criminal cases. This bill would delete this language entirely. Then the bill tackles the carry permit scheme. It begins by deleting N.J.S.A 2C:58-3(c)(5), which prohibits the issuance of a carry permit to someone in cases where it is considered to be against the public’s health or safety. Given the other reasons why one may be denied a permit, this particular provision is not only superfluous, but dangerously vague, in that it serves as a fallback provision upon which to deny someone otherwise eligible. The bill also removes any special provisions for armored car personnel, applying a uniform standard to all applicants. If you are interested in the constitutional right of citizens to defend themselves against threats, wherever those threats might occur; disappointed (to put it mildly) in the current state of New Jersey’s firearms statutes; or want to get a carry permit in New Jersey for any other legal reason, this bill would greatly increase your ability to do so. Thompson Law Offices encourages the participation of the individual in both the legal and political system. If you wish to get involved, you will find links to a map of the Assembly districts and contact information for your representatives below. * If you have been involuntarily committed for mental health evaluation in New Jersey or Pennsylvania, you are invited contact our office for a free consultation. You may have the ability to expunge the commitment. An attorney will be able to advise you as to the effect an expungement may have on your ability to possess or carry a firearm. The Eastern District of Pennsylvania recently released a decision in the combined cases of Fields v. City of Philadelphia and Geraci v. City of Philadelphia. Both of these cases involved the constitutionality of recording police officers performing their duties in public places. At the end of the analysis, the Court held that there is no First Amendment right to record police officers without some form of criticism involved. The decision is unfortunately dangerous on both a practical and a theoretical level. Expressive conduct is activity that can reasonably be viewed as promoting an idea or expression. Thus, flag-burning, picketing, the wearing of an armband, etc. can be deemed “expressive conduct” because they intend to relay a political point of view through conduct. Because the plaintiffs here did not issue verbal political statements, the Court used the “expressive conduct” analysis. In Fields and Geraci, the Court found that there was no expressive conduct. In the Fields case, the plaintiff was walking on the sidewalk, observed a large group of police officers, and thought it “would make a great picture.” He stopped to take the picture, an officer approached him and asked if he like taking pictures of grown men, and then told him he was blocking a public passage and needed to move. Fields stated he was within his rights to be where he was, and he was arrested. In the Geraci case, the plaintiff was attending a protest against fracking in order to observe the interactions between police and protestors. She was, in fact, an activist and her specific reason for being at the event was to observe and record activities for her organization. She apparently wore a pink bracelet identifying herself as a member of the organization. When a police officer began to arrest a protestor, Geraci moved closer (but not in a distance to interfere), when the officer pushed her against a tree and held her there so she could not continue recording. To reach its decision, the Court ultimately sifted through a series of cases from the Third Circuit (the federal appeals court for Pennsylvania, Delaware, and New Jersey). The legal research found no evidence of a right to freely record police officers; the most the Third Circuit had to say up to this point was that an individual “may” have the right, so long as the recording is accompanied by a context indicating that it is “expressive conduct.” The Court found that merely observing cannot be deemed “expressive conduct.” And because the Court determined that the plaintiffs “are not members of the press,” they had no First Amendment right to record without an accompanying protest or challenge. This holding is dangerous for two reasons. First, the Court held that in order to be protected by the First Amendment, one’s recording of police must be accompanied by an active protest of police actions. This, again, has two major problems: (a) if the police have engaged in inappropriate conduct prior to the recording, the individual has no mechanism to show the inappropriate conduct, short of a police report and the individual’s own testimony; and (b) given that both individuals claim that there was a significant use of force against them (and Fields was actually arrested) for recording without protest, one can imagine the risk an individual takes to his person and liberty should he (or she) attempt to record police activity while actively protesting the individual’s own treatment. Constitutionally speaking, this is a dangerous ruling, as well. The District Court found that the plaintiffs were not members of the press. Notably, the Court failed to explain its decision here and offered no reasons why someone taking interesting photos of city activities and a political activist specifically seeking to observe and record police activities are not to be considered journalists. The Court noted the “instant image sharing technology” available to share the images recorded by the plaintiffs, so that presumably it assumed that the plaintiffs had at least some intention of sharing the recordings. We have already seen attempts by the government to determine who, precisely, is considered a journalist. The First Amendment protects the freedom of the press, in addition to the freedom of speech, assembly, petition, and religion. These rights protect the individual against encroachments by the government. It is exceedingly dangerous, then, to allow the entity against whom we are protected to define to whom the protections apply. That would be equivalent to allowing the individual to determine his/her own tax deductions, or a criminal suspect to determine which sections of the Crimes Code applies to him. To cite another, perhaps more important, example: prior to the American Revolution, the primary media was newspapers and pamphlets. In the 1760’s, after the rather expensive French and Indian War, the British government began placing taxes on various objects and activities. To state their objections to this and other recent policies, the American colonists ran newspaper editorials critical of the British Parliament and individual officials. To curb this, the British government exacted a tax on newspapers (and some other legal documents). This action, called the Stamp Act, was one of the major contributing actions (among a series of impositions by the British) that led to the American Revolution. Thus, when forming the Bill of Rights, the drafters were careful to include the freedom of speech and of the press as one of the first rights (second only to religion) protected against government encroachment. By defining who the press is, the government limits the protections of the First Amendment perhaps more than the initial Stamp Act did. Today, taxes and fees exist at every level of conducting business, a fact the colonists would likely abhor, but is fully accepted today; here, however, the government actually defines who may receive constitutional protection and who may not. The manner in which the Court matter-of-factly states that the plaintiffs were not members of the press is certainly disturbing; it is apparently so evident to the Court that no explanation was needed. (As an aside, this is a different argument than requiring press passes into a press conference at an official press conference – while the government may decide to whom its officials will personally speak, it cannot prevent another individuals from reporting on what was said). While the First Amendment claims were unfortunately dismissed, the Fourth Amendment unreasonable search and seizure, false arrest, and excessive force claims will ultimately go to trial. The search and seizure claims may very well be affected by this decision, however, as officers (and other public officials) have qualified legal immunity against liability if the actions were not clearly unconstitutional at the time. If there was no right to record police and Fields refused a police command, then perhaps it was “reasonable,” in the legal sense, for the officer to seize his phone and search it. I certainly hope that is not the case, but I have seen more loosely connected logic in grants of qualified immunity. The attorneys for the plaintiffs have indicated that they will appeal this decision to the Third Circuit. One hopes that that court will recognize the right to record public officials in the course of their public duties, regardless of who is doing the recording. * Other states may recognize the right individually. This is merely to show states in which the federal courts have stated there is a right to record police under the U.S. Constitution. New Jersey, for example, has held that there is a right to record police officers, essentially adopting the First Circuit’s reasoning. **This case currently applies only within the boundaries of the Eastern District of Pennsylvania and, as a district court case, is binding on the parties. However, the case may be used as persuasive authority in any legal proceeding. This means that while not binding on persons who are not parties to the case, Thompson Law Offices, LLC would not advise recording police officers in Pennsylvania at the present time. In an opinion today, Judge Mark Kearney ruled that citizens who, at the time of recording, do not intend to challenge police activity, have no right to videotape police officers performing their duties in public. You can read excerpts of the decisions here, as reported by The Legal Intelligencer today. The opinion was not publicly available online at the Eastern District’s website and the decision may not be appealed immediately, as there were other issues to be decided in the case. However, the attorneys for the plaintiffs have indicated their desire to appeal the case, according to the article. Once the opinion has been made public, Thompson Law Offices will review the decision and post further analysis. However, given the importance of the case, it was felt necessary to post the decision, without analysis, sooner, rather than later. We are deeply saddened to learn of the death of Justice Antonin Scalia. Throughout his nearly 30 years on the U.S. Supreme Court, Justice Scalia championed the U.S. Constitution and the system of government established and envisioned by our founders. He will be sorely missed.